The Commission presents today a clear, comprehensive and transparent summary of instruments regulating the collection, storage or cross-border exchange of personal data for the purpose of law enforcement or migration management, setting out at the same time the core principles that should underpin the evaluation of information management instruments in the area of freedom, security and justice. Citizenship bill: one more bitter provision. On the new citizenship bill now discussed at the parliament we have already posted here and here. The current version seems to be even worse than the ones that gave rise to so many reactions for their insufficieny and calculated segregation effects. Many of the conditions for eligibility demanding political and social conformity have already been pointed out (click on the links above). What is new in the now discussed version is a small addition providing that the rationale of the state for rejecting an application will not be made known to the applicant when involving issues of the “general policy of the country”. Which means that applications by whole categories of immigrants could be rejected in bulk and on no justification, should them immigrants, for instance, come from countries Greece has disputes against or wants to put pressure on, etc. 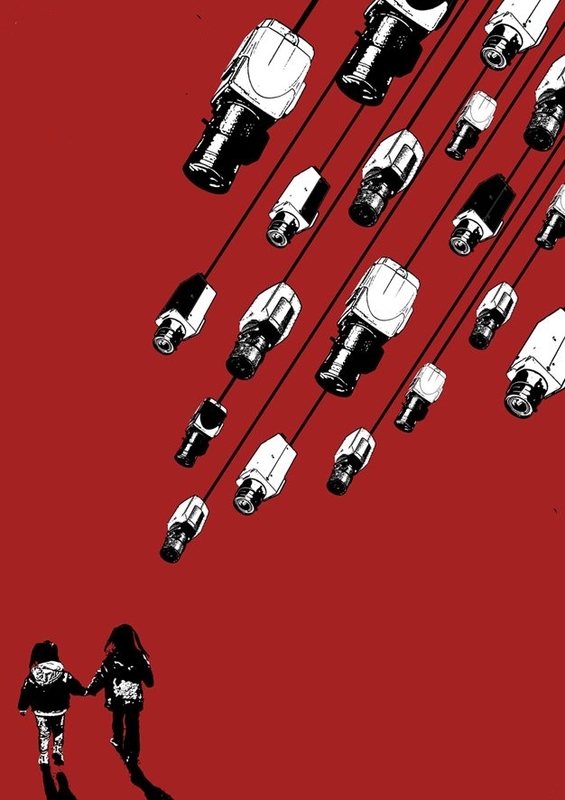 Immigrants amidst the process of citizenship acquisitions are thus turned into leviers of foreign policy and tools for geopolitical pressures. Citizenship rights get dependent not only to personal conduct but also to intrasnsparent “general policies”. 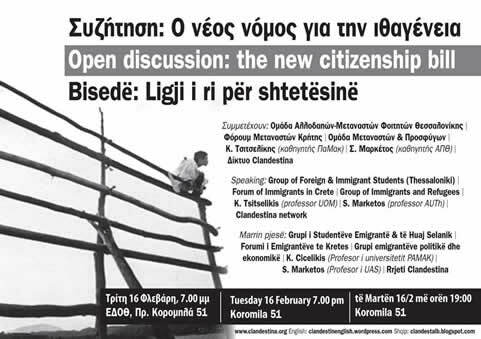 Open discussion in Thessaloniki: the new citizenship bill. Τuesday 16 February. The final (Feb 4) version of the immigration bill: from bad to worse! The final, modified version of the draft law which was officially announced on February 4, 2010! Both parents of the child to be entitled to citizenship must meet the requirement of 5 years of incessant legal residence in Greece (first version provided for only one parent). Adult immigrants to be eligible for citizenship must present proof of 7 – instead of 5 as was first proposed – years of incessant legal residence in Greece, to which the further requirement of a “long residence permit”, which has been granted to just 130 persons since its inception in 2006!). Special Civil Education and History tests set up by the Citizenship Committee. That there are no “public or national security” reasons to deny citizenship. According to the ministry of interior those eligible to file an application today are: 130 long residing people, 14.000 with a 5 year residence, 1.000 parents of Greek citizens, 1.000 entitled to international protection, 120 people with no citizenship, a sum total of less than 16.500 people! “1984 is here, no really, this time we’re not lying , honest”. Second-generation immigrants who are hoping to obtain Greek citizenship under the new law proposed by the government yesterday discovered that the conditions for doing so are going to be substantially stricter than had originally been announced. PASOK submitted the revised bill to Parliament yesterday and it soon became apparent that some of the draft law’s provisions have been tightened up following a period of public consultation during which there were many objections to what some people regarded as the ease with which citizenship would be awarded. Under the new provisions, a child born in Greece to immigrant parents will need to have had both his father and mother living in the country legally for five years before he or she can apply for citizenship. Originally, only one parent would have had to be a legal resident. Also, the children will have to prove that they have spent at least six years in Greek schools rather than the three years originally proposed by the government. In another major change to the initial plans, applicants will also need to produce recommendation letters from three Greek citizens. 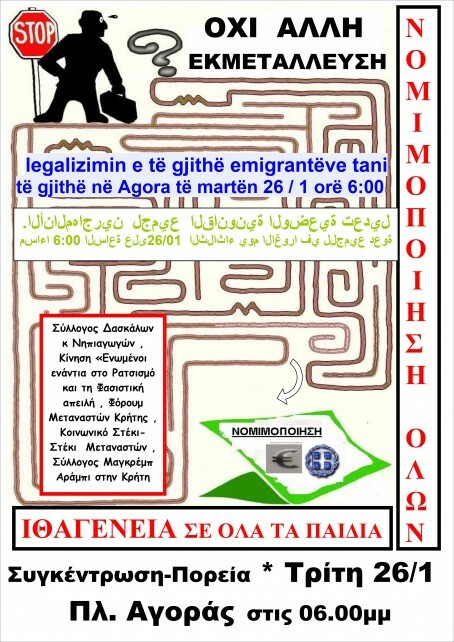 The proposed law would still allow second-generation immigrants to vote in local elections and to stand as city councilors after obtaining citizenship and proving that they have a good command of Greek. The Interior Ministry estimates that the bill would allow more than 250,000 people to join the electoral register after gaining citizenship. Interior Minister Yiannis Ragousis said that the imminent law would apply to any immigrants who obtained legal status up to January 2005. Despite the stricter measures contained in the new bill, New Democracy still criticized the draft law for being too lax. “Every immigration measure that the government has announced so far constitutes the lowest threshold anywhere in Europe for awarding citizenship to immigrants,” said ND spokesman Panos Panayiotopoulos. Meanwhile, the Church of Greece’s Holy Synod said it believes the bill does not effectively tackle the country’s immigration problem.